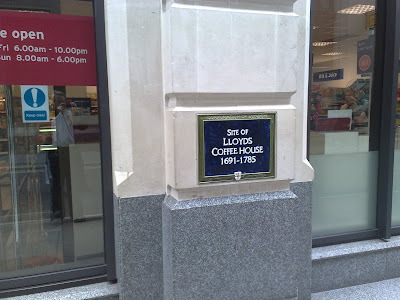 Lloyd's coffee house v2. See wikipedia. This final class engaged with Boland and Collopy’s proposal that managing is designing and Roger Martin’s call that managers be more like designers. Developing further Herbert Simon’s distinction between the sciences (exploring what is) and design (what could be), these educators have begun to change management education in theory and in practice. Armand Hatchuel's further development of Simon's ideas provides an important way forward for theories of design and their relevance to managing and organising, beyond problem-solving. To test some of these ideas, the class undertook a short practical exercise in which they applied design frameworks to business models. Inspired by the example of Alex Osterwalder, whose blog and forthcoming book describe how his firm applies design to business modelling, the class first sketched a business model known to them; discussed it; and then selected other frameworks to apply, such as mapping stakeholders; analysing it for usefulness, usability and desirability; and creating stakeholder journeys. What all the groups found was that the (apparently simple) activity of drawing a diagram helped the group reach understanding and agreement about what they were talking about. Some groups learnt nothing new by drawing the business model of the organisation they were discussing; they found they had to find new ways to represent the organisation visually in order to generate ideas. Others found that combining the business model diagram with the stakeholder map helped them generate new concepts that could potentially reframe the core business. One group acted out their understanding of the difference between the company’s core offering and how competitors might respond to customer needs, illustrating how human-scale stories offer decision-makers meaningful accounts that highlight opportunities for change. At a time when people all over the world are facing huge challenges, both business education and design’s role in creating unsustainable consumption are being criticised. Meanwhile design schools are beginning to offer MBAs (like at CCA, led by Nathan Shedroff, interviewed here) and b-schools are teaching design practice as part of MBA electives (like mine) or in their core curriculum (like at Imperial College, or Case Western Reserve). But it’s too early to tell what impact these educational developments will have and indeed, whether these new institutional arrangements will last. This elective I have designed and taught will continue to exist at Said Business School for one more year (since my current fellowship will end in September 2010). I’m grateful to the students with whom I have had an opportunity to learn through prototyping these ideas over the past four years. Dunne, D. and Martin. R (2006) “Design Thinking and How It Will Change Management Education: An Interview and Discussion”, Academy of Management Learning & Education, (5) 4, pp. 512–523. I'm looking forward to this event, organised by curator Sophie Hope and Elaine Speight, taking place at Birkbeck in London on July 1. More details on their blog here. Most of the speakers are artists and social scientists who use playful enquiry as a tactic for research. I'm going to be talking about my rat project and showing (at long last) a short film I made about the event I organised at Camden Arts Centre back in 2005 attended by about 40-50 rats and 400 people and which showcased the world premier of the "Is Your Rat an Artist?" drawing competition for human-rat-software assemblages. For this class, the MBA students travelled to London. 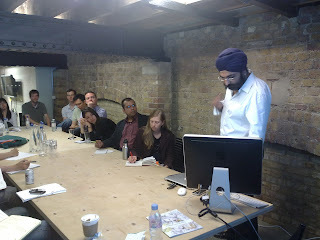 First we visited the Hub at Kings Cross to meet Inderpaul Johar of architecture practice 00:, who designed it. 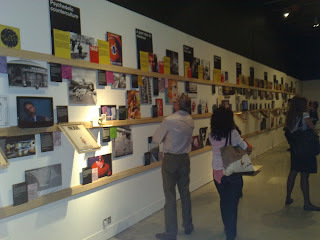 Then we went to see the newly-opened show SuperContemporary at the Design Museum, followed by a visit to service design consultancy Engine. Together, these encounters offered a rich set of experiences illuminating some of the current conversations within design practice. The Hub is a fast growing enterprise offering members desk space at convenient locations in major cities. Unlike other such offerings, The Hub is designed around a shared ethos with a particular focus on social entrepreneurs. Involved in designing both the physical space and the way it operates in practice, Indy explained how the design of the social architecture is critical to the success of the operation – for example, having a strong gatekeeping function, and employing a “host” who helps people connect with one another. 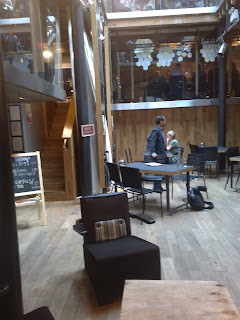 We also saw how the physical arrangement of space, combined with these practices, resulted in a viable and profitable social enterprise with much higher use of space than similar ventures. Indy talked more broadly about his firm's practice and the ways they aim to design sustainable institutions, not just physical assets. Later, we visited Engine Group, one the leading service design consultancies, where Aviv Katz and Gavin Maguire talked us through two projects - one public sector and one commercial. In their work for Kent County Council, Engine have helped create the Social Innovation Lab for Kent (SILK). This work has resulted in the council's own teams learning design approaches and methods and developing new tools to help use design to lead to innovation in council services. (See this video). We also heard Engine's experience of working with Virgin Atlantic on the design of the terminal within a terminal in London's Heathrow, where insight gathering was used to generate service principles on which to base the design of the customer experience delivered through various touchpoints. 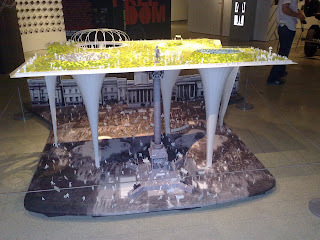 I hope to do a separate post about SuperContemporary, the new show curated by Daniel Charny at the Design Museum open until October 4, but if I run out of time, I’ve included a few images here including a visionary garden hanging over London's Trafalagar Square by El Ultimo Grito with Urban Salon. This class was an opportunity to get messy through design. I asked the students to use two design methods - following "extreme users" and "experience prototyping" - to analyse the stakeholder experience at the train station, come up with improvements, and quickly prototype the improved experience to share their ideas. Like von Hippel’s lead users, the idea of extreme users offers to way to understand the service by looking at the margins of the stakeholder group (eg people who do not speak or read English). By looking at the service through the experience of extreme users, the students uncovered some surprising assumptions built into it. Analysing these may offer easy ways to improve the service experience from the point of view of many other kinds of stakeholder. Having been to the station following one of the members of the team (the extreme user - see the photo in which the student presents a piece of paper to the customer service rep saying he doesn't speak English) and documenting this through photography, video and sketching, the teams generated ideas to solve the problems they identified. The next task was to mock up, using whatever means seemed appropriate, the experience of part of the service, as a way of making tangible and testing some of the improvements they came up with. Finally, we invited someone to walk through these prototypes. The reading for this week drew on recent work on the boundaries of ethnography and design ("anthrodesign"), participatory and inclusive design, and the notion of wicked problems. Once multiple stakeholders with very different ways of understanding the world are asked to frame problems, design methods which serve to create visual and experiential representations can play an important role in tackling such problems.